My interest in Robert Croome was aroused recently when I cam across a tiny hooded clock with alarmwork by him in a walnut hood. Strictly speaking this should be called an alarm timepiece, as such clocks do not strike the hours and the word 'clock' relates really to one which strikes. He is not a well known maker. I looked up what little is documented about him in the late Graham Dowler's book 'Gloucestershire Clock and Watch Makers', though it was not much. Dowler quotes a marriage allegation of 7th August 1762, which described him as a watchmaker over the age of twenty one intending to marry Mary (Hull?) a spinster also over twenty one. The term 'watchmaker' and 'clockmaker' were interchangeable and this does not mean that he made watches, which is extremely unlikely. An allegation was a certification of the intention to marry by licence, and these intentions were not always carried out. A licence was a 'quicker' way to marry and did not involve the usual three weeks of residence, which the calling of weekly banns required. It was also more private and so was for some people more convenient, especially in the upper echelons of society. But because it was quick, marriage by licence was sometimes done by those with some questionable need to get married in a hurry. The signed statement that the parties were over twenty one, was required to try to prevent runaway marriages of under-age children marrying without the consent of parents. Once over twenty one you did not need parental consent. I have not been able to trace an actual marriage, but that does not mean there wasn't one. In fact there almost certainly was, as Dowler also records the granting of letters of administration on his death (16th April 1768) to his widow, Mary. That is all we know about him biographically. I tried to trace his birth and the only likely baptism I found was one at Cromhall near Thornbury, near Bristol, in 1738, a child Robert baptised to parents John and Ann Croome. If this is the right Robert Croome, he would have been aged twenty four when he married and thirty when he died. This means he had a surprisingly short working life or perhaps no more than six years, in which period he can have made very few clocks - or perhaps I should say it is likely that very few that he made are likely to survive today, especially in view of the fact that the type of clock he made was long ago obsolete, replaced by the cheap, mass-produced spring-wound bedside alarm clock, and therefore suffered a very high destruction rate. 1. Hooded clock in a walnut veneered hood signed 'Croome Wotton'. Walnut is exceptionally unusual for a country hooded clock. Date about 1765. We do not have any record of his apprenticeship, but such records as do exist are only partial, based on a duty paid to the Inland Revenue on the fee paid to the clockmaker by the boy's parents. No official record was kept of those apprenticeships which escaped the tax - such as those undertaken with a low premium from the parents of boys from poorer families, those made between father and son, or those paid out of the parish rates for orphans or children of destitute parents. So the absence of an apprenticeship record in the Inland Revenue files does not mean that he was not apprenticed. His work is highly skilled and professionally executed, indicating that this was not some self-taught village clocksmith but a professionally-trained craftsman. Even though his clocks are of a modest and simple type, we can judge that the workmanship is of the highest standards, and that suggests to me that he was properly trained in the craft. If he was from Cromhall and was trained by a real clockmaker, the only one who comes to my mind was Thomas Cox of Cromhall. Thomas Cox senior, and his nephew and successor, Thomas junior, are a bit confusing as clocks by them are known signed both at Cromhall and at nearby Thornbury. But if Robert Croome grew up in Cromhall, he must have known the Cox family and, if he was trained in clockmaking, where better to go? As a habitual record keeper I tend to note down such trivial things and I know of only two other clocks by Robert Croome apart from this present one. One was a surprisingly similar hooded alarm clock I owned some year ago, though it was housed in an oak hood. The other was also a hooded alarm wall clock of the same type. These were small cottage alarm clocks, cheap to make, cheap enough to be bought by a rural community, trouble free to run, very robust and easy to service if need be. The owner could even lubricate it himself with a bit of butter or goose grease, as these clocks were generally good 'runners', even when worn and the engineering became 'loose'. I have seen other clocks of this type from Wotton, in particular made by Thomas Shepherd, who worked there a little later. It is a type well known in this region, for the reasons just given. I have also seen examples made by the Voyce family of the nearby Forest of Dean. 1. The six-inch dial of the Croome timepiece alarm after cleaning. Dowler quotes from a book of 1962 describing clocks by another Wotton clockmaker, who was burdened with the unwieldy name of Fuber Combe Gerrans - quite a handful to call out in the school register, and a unique combination of names said to derive from a mother's maiden name and that of a Cornish village taken from a Celtic king! Happily he signed his clocks simply as 'Gerrans' or 'F. C. Gerrans'. In that book the author refers to the clocks he made as: "The majority are cheap but nice thirty-hour bracket alarm clocks for the mill workers, such as are occasionally to be found at the local Marine Stores for 1s 6d each (7.5 new pence) ...". I can't help but think this is a slight case of hyperbole. I was around in 1962 and never saw one at that price, but still the real point is that this type of hooded alarm clock is a typical local product. The alarmwork on this example is set between the main plates. It was not uncommon for some examples of hooded timepiece alarms to have the alarmwork set to one side on a separate mounting. Alternatively it could be set behind the time train inside the back of the movement. 1. The movement pictured before cleaning. 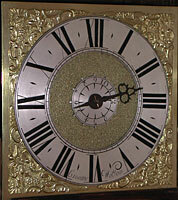 The clock is well made by a professional, not rustic clocksmith work. The alarm is set between the plates on the right hand side. This particular clock hood is made of oak but is veneered with walnut. Walnut was a choice wood, much favoured for its fine figure and surface texture, but was very rare in England at this time. Walnut trees were slow growing and relatively small, which is one reason the wood was almost always used as veneer, not in the solid. Another reason was because it would shrink, twist and split if used in solid unless it had the most miserable plain grain, and then the woodworm would eat it. So for practical reasons walnut was usually used as a veneer onto an oak base, which was then pretty well immune to woodworm. Most native walnut is believed to have been used up by the second quarter of the early eighteenth century, after which a less well-figured variety was imported from Europe. However a few garden walnut trees survived, and it was probably from veneer taken from such a tree that this hood was made. Hooded clocks, being a cheaper type, were more usually housed in oak hoods, and sometimes even hoods made of pine, painted when first sold but today often seen as 'stripped' pine. On these cheaper examples it was common to have no hood door, and to have no protective glass to cover the dial, but just have the dial open to the elements - it simply saved money in the making of the hood. From the point of view of clocks by Robert Croome, I know of no longcases by him. A clockmaker setting up newly in trade would be struggling to make any kind of living in his first years in a place as small as Wotton, population in 1800 one thousand five hundred. With a working life, which lasted only about six years, it may be that Robert Croome never made more costly clocks, such as longcase examples. The very nature of these rural alarm clocks has been the cause of their scarcity today, as very many were scrapped. Longcase clocks on the other hand did have a greater chance of survival. All we have to go on today by which to judge his work are the three examples of hooded clocks known to survive. Footnote. A longer version of this article was first published in Clocks Magazine.